US$22.95 shipping and handling included (US and Canada only). US$22.95 plus $9.00 shipping cost outside North America. It's all here in The 5th OPTION: What Life is; What it is doing here; and How it got here! The answers will change forever your perception of reality! What, exactly, is this phenomenon we call "biological life"? What, exactly, is it doing here on our planet? How did it get here? This is how an engineering mentality approaches the origin-of-life issues - from the "top down". Could this intricately intelligent evolving system we call "life" really have self-generated out of random lifeless chemical elements from scratch, as mainstream science (the 2nd Option) would have us believe? Don't count on it! 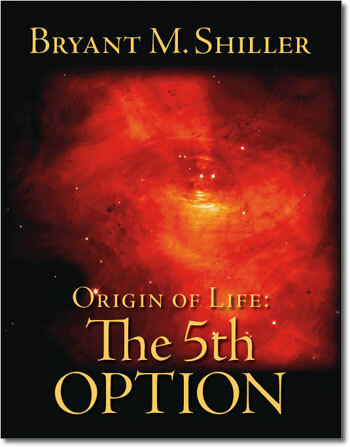 THE 5th OPTION explores that possibility and concludes that the odds of it happening all by itself -without outside help - are virtually zero; the system of life on our planet was designed and implanted on our planet some 3.8 billion years ago purposefully and in order to accomplish specific goals. THE 5th OPTION engages in the novel process of reverse engineering the system of life in order to try to understand what possible practical use the phenomenon is “good for” in order to comprehend what, indeed, it might be doing. Bryant Shiller, an engineer, puts himself "in the shoes of a would-be designer of the system of life" and asks the provocative question: "What would I - the hypothetical designer of the interactive system of life on planet Earth - have had in mind to have designed this planet wide system in this particular way? After all, system designers always have choices among various design alternatives and ultimately choose those that best serve the purpose-specific "design intent". This design intent is ultimately revealed. 1] The undeniable existence of biological evolution as the built-in “adaptive sub-system” of the life-system design. With the introduction of a novel “Quantum Theory of Evolution”, the author demonstrates how the system of biological life controls from within the two major mechanisms that direct evolution – that allows the system to both anticipate as well as channel the directions evolution can take. In the process, solutions are offered for: the enigmatic spotty fossil record (you can’t find the missing fossils because they do not and need not exist); the mystery of the evolution of complex organs - those endowed with (according to Michael Behe) irreducible complexity; Stephen J Gould’s puzzling punctuated evolution. 2] A generic definition of the life phenomenon in terms of the laws of thermodynamics. 3] A generic definition of intelligence as a quality that both is qualitatively the antithesis of, and quantitatively the reciprocal of, the randomness that is at the heart of the inanimate world. 4] Life portrayed as an intelligent system based on a “primary design platform (PdP)” that is immune from evolution and that epitomizes the basic building block of biology – the biological cell - as the product of nanotechnology. 5] the genetic code endowed with an ingenious intelligence scheme upon which all biological activity depends – a scheme that must have predated the origin of life itself. A novel statistical analysis of all possible single nucleotide basepair mutations (576 to be exact) reveals the true nature of the genetic code as an efficient “non-random evolution filter”. 6] the possible inclusion of a self-limiting feature within the life system design that would serve to target specifically any evolved species capable of advanced technology. This has important consequences that could threaten the future survival of the human species. The unexpected conclusions are nothing short of spectacular! Extraordinarily, the Rational Design Hypotheses is scientifically credible and relevant for one important reason: it is testable. Shiller defines where to find the evidence of design and how to access it. What does the RDH model have to say about the would-be designer? The origin of the designer question is ultimately considered in depth and dealt with. What are the unexpected consequences for human survival? The RDH model deals with these issues and much more. The results are eye opening and alarming! You will walk away from this exercise with a totally new appreciation of the significance and meaning of life, and the essential part you play in it.